A Twist in History: Who was Jacob Haish? Jacob Haish was an early inventor of barbed wire in DeKalb, Ill. 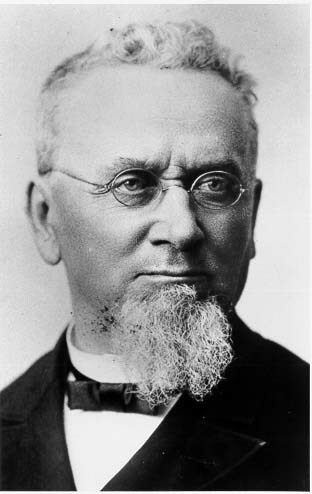 He was born in 1826 in Brandische, near Carlsriche, Germany and came to the United States with his family as a young child. They first lived in Ohio and he learned the carpenter trade from his father. He came to Illinois when he was 19 years old, first living in Naperville (in DuPage County) and marrying Sophia Brown there in 1847. After they wed, they purchased a farm in Pierce Township, and in 1853 they moved to Buena Vista, which today is known as DeKalb. DeKalb was very small at the time and Haish saved $100 to purchase lumber and start his work as a carpenter. He would later build many prominent homes in the city of DeKalb, some of which still stand today, according to "Oxen to Jets." His idea for barbed wire stemmed from complaints from local farmers. According to "Oxen to Jets," "Mr. Haish first tried to use osage orange with its thorns for fencing but that proved impracticable ... He tried one wire, then two, then rather abandoned the idea as impractical. One day a farmer, F.W. Pierce, came into [Haish's shop,] saw the wire and purchased it for fifty-two cents." That transaction is believed to be the first purchase of barbed wire. Haish would experiment more with the design, and found improvement when he created his soon to be famous "S" barb. He applied for a patent for the design in 1874, but was not awarded the patent until 1875, which was almost 10 months after his rival, Joseph F. Glidden, received a patent for his own design, according to documentation at the Ellwood House Museum. Haish had earlier filed for patents on other designs, so until his death, just shy of his 100th birthday, he would proclaim to be the first inventor of barbed wire. From his first patent, he would spend most of his life dedicated to his work, such as creating barbed wire and building a grand mansion to call his home. He would also spend countless dollars on charitable projects in DeKalb, along with his rivals Isaac Ellwood and Joseph Glidden. One of their greatest accomplishments as a team was bringing Northern Illinois State Normal School, now known as Northern Illinois University, to DeKalb. Haish was known as a philanthropist for these projects throughout his life, but some of his greatest contributions to the community came after his death. Because Jacob and his wife Sophia did not have children of their own, they chose to let their wealth benefit the community. Donations funded projects such as the Haish Memorial Library, now known as the DeKalb Public Library, the first books in the Northern Illinois Normal School Library, Haish Gymnasium and the DeKalb Public Hospital. His contributions even reached as far forward as 2006, when the final $450,000 of his estate went to fund part of Kishwaukee Community Hospital. In return, the emergency room wing was named after him. But who was Haish? Those stories are a little bit harder to track down. "Mr. Haish's career seems phenomenal. It was due to labor, energy and perseverance. He made the most of his opportunities, was not extravagant, and is now reaping the rich reward of his labors. His manner is quiet and straightforward. He always says exactly what he means, without useless compliment; is not slow to condemn injustice nor to reward faithfulness. His greatest enjoyment is at his own fireside, where, with his wife and friends, he is found to be a delightful companion. He is retired and conservative before the public, and commands the respect and admiration of all who know him." This blog will tell in-depth stories on each of these aspects of Haish's extensive life. Please come back to A Twist in History to see more. Ellwood House Museum in DeKalb, Ill.